Home> Events> Dr. Gabor Maté - Who do you THINK you are? Dr. Gabor Maté - Who do you THINK you are? Experience a mind-bending day long workshop with Dr. Gabor Maté and Diederik Wolsak, exploring how our early environments powerfully influence the way we think, and how we interpret “what is” through this filter. Once we are aware of how our mind creates our world, we can access greater resilience and choice in responding to the present, and in determining our future. This awareness is helpful in overcoming addiction, illness and physical and emotional pain. Interspersed throughout the Saturday workshop, you will learn several short powerful meditations from the Kundalini Yoga tradition, taught by Sat Dharam Kaur ND, to help develop enhanced responsiveness of the brain and nervous system. Diederik Wolsak RPC, MPCP: His journey started in 1942 on the island of Java, Indonesia. He spent the first three years of his life in Japanese concentration camps. At age 8 he was sent to a foster home in Holland and by the time he rejoined his parents and brothers two years later he was filled with self-hatred and fear of the world around him, leading to prolonged alcohol and drug abuse. At age 50 Diederik realized that there had to be a better way or there would be no point in continuing and he entered upon a spiritual path of deep healing. This path eventually led to a fulfilling career as a counselor in private practice. Diederik is the founder and program director of the Choose Again Attitudinal Healing Centre and is the lead facilitator of both the Vancouver and Costa Rica arms of the organization. He is an international workshop leader, public speaker and relationship counselor with years of experience in group facilitation. Sat Dharam Kaur, ND is a certified Kundalini Yoga teacher trainer and instructor, author, and naturopathic doctor practicing in Owen Sound, Ontario. 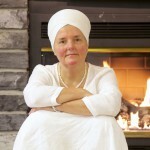 She has studied Kundalini Yoga with Yogi Bhajan since 1976 and has facilitated teacher training programs in Toronto (ON), Canmore (AB), and New Mexico. She developed the Beyond Addiction program with Jiwan Joti Kaur PhD, inspired by the teachings of Yogi Bhajan and Dr. Gabor Maté. She has also developed a breast health yoga training, designed to help educate women in breast cancer prevention through Kundalini Yoga and lifestyle change. From an early age many of us develop a coping style that keeps us out of touch with signs of stress, and suppresses so-called negative emotions, particularly anger. This deservedly popular book shows how such “hidden stress” is related to the onset of chronic diseases. Comprehensive source of information for all aspects of health for women. More and more women seek natural remedies to treat health problems, either as an alternative or a complement to conventional health care.